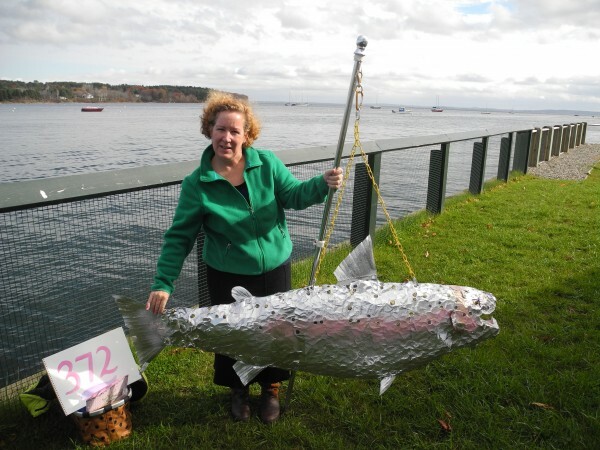 Sally Jones of Bangor brought her silver salmon to the Wednesday press conference held by opponents of a major dredging project. "We need to be mindful of all the creatures we share Penobscot Bay with," she said. Opponents of a U.S. Army Corps of Engineers dredging project used this chart to show the proposed dredging and dumping sites Wednesday morning at a press conference at the Belfast Boathouse. 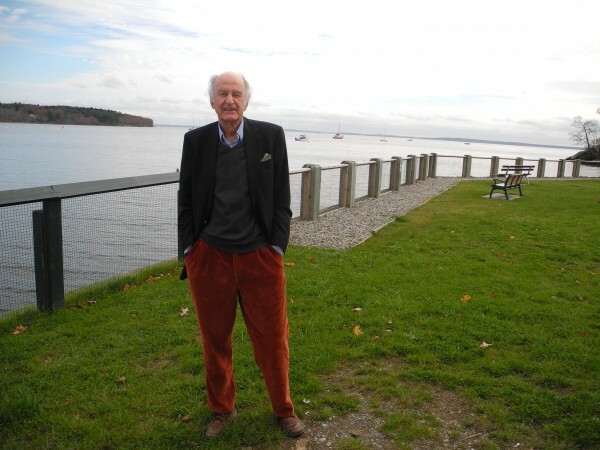 Arch Gillies, chairman of the Islesboro Board of Selectmen, said Wednesday that a major dredging project in Penobscot Bay is troubling to him and other islanders. BELFAST, Maine — Sitting before a view of sparkling Penobscot Bay, a group of Maine lawmakers and local officials on Wednesday called for the U.S. Army Corps of Engineers to proceed slowly with a major dredging project they say could threaten the environment and the local economy. 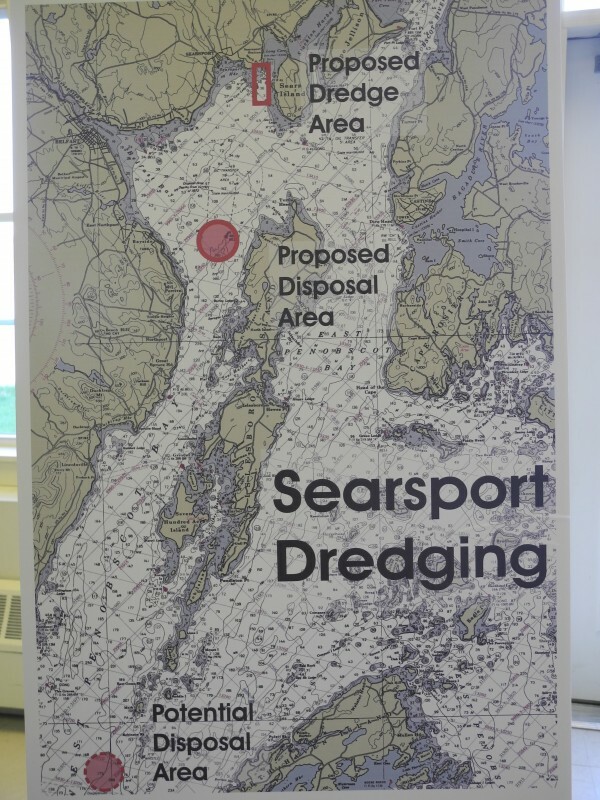 If the $12 million Searsport Harbor project is completed as proposed, the Army Corps would dredge nearly 900,000 cubic yards of silt and sediment to enlarge the entrance channel and turning basin that leads to the Mack Point industrial port. Engineers also would dredge about 37,000 cubic yards of material to maintain the federal navigation channel, which has not been touched since 1964. During a morning press conference held at the Belfast Boathouse, the lawmakers emphasized that they do not oppose the maintenance dredging but are dubious about the need to enlarge the channel. Rep. Mick Devin, D-Newcastle, who is a marine biologist, told the roughly 50 people in the room that he was worried about detrimental effects to lobster, sea urchins and scallops that use the dredging and dumping areas as nursery grounds. Altogether, the engineers would dredge and dump enough sediment to fill about 280 Olympic-sized swimming pools. Devin is one of nearly 30 legislators from the Penobscot Bay area to sign a formal letter asking the engineers to conduct a “full and comprehensive” environmental impact study for the project. But those in favor of enlarging the channel say that it’s necessary for safety purposes for existing tanker traffic in the bay. Larger vessels used today have a deeper draft, David Gelinas of the Penobscot Bay & River Pilots Association told the BDN in April, and insurance underwriters now are requiring ships to operate with more draft, too. “We’re trying to get a larger margin of safety,” he said. Arch Gillies, chairman of the Islesboro Board of Selectmen, said at the press conference that selectmen and island fishermen are all “very, very concerned” about the possible harm of the dredging and dumping. The materials would be dumped either near Islesboro or in an alternative site in the lower part of Penobscot Bay, 25 miles south of the dredging. Larry Rosenberg, chief of public affairs for the Army Corps of Engineers in New England, said Wednesday that at this point, the agency is still evaluating public comments about the dredging and have yet to make an analysis of those comments or come to any decisions about the project. “It would be way premature to try to look into a crystal ball and try to make an assessment without fully analyzing the information,” he said, adding that he also cannot share any project timeline with the public.